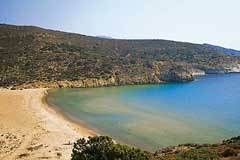 Agathia is a small beach on the north western side of Milos, accessible through a track road from Emporios. This beach is totally unorganized andhas no tourist facilities. The surrounding nature is wild, with short vegetation and low cliffs. The seabed is partly rocky and partly sandy, but the water is clean.